Blue Devils (1st, 95.05) finished just two tenths of a point ahead of Carolina Crown (2nd, 94.85), as the DCI Eastern Classic wrapped up its second night of competition, Saturday, Aug. 3, in Allentown, Pa. "Allentown's always a big challenge for the Blue Devils," Drum Major Kristen Lichtenthal said. "We're far from home and don't always have a lot of love. We see it as a chance to show what we've got and try to earn a few fans. The crowd started off kind of quiet, but by the end of the show, everyone was on their feet for the standing ovation." 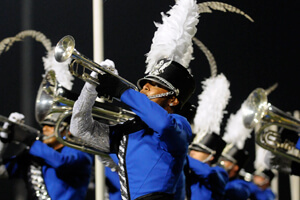 Lichtenthal went on to say that she believes the corps members have finally harnessed the energy they need to bring perfection to their performances as the season-ending DCI World Championships get started next week in Indianapolis. "When we came off the field, everyone was literally steaming," Lichtenthal said. "You could see it in the air. That really illustrated the incredible energy we have this season." After outscoring the Blue Devils less than a week before in Salem, Va., Carolina Crown took first in General Effect, also leading in the Brass caption. 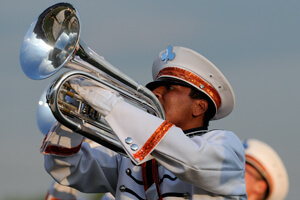 "For us, keeping our mental strength up has been a challenge," Drum Major Linda Harvey said. "It's hard for members not to let their brains come in and tell them they're too worn down to keep going. But everyone's still wanting to keep our momentum going, to see if we can make history." Boston Crusaders (4th, 88.50) finished ahead of Madison Scouts (5th, 87.65) for the first time all season, edging closer to the Cavaliers than the two have been all season (3rd, 88.75). "Bringing some of our members up to the maturity level of some of the other members has been a challenge this year with a younger corps," Cavaliers Drum Major Jerrin Harrison said. "But now they're really starting to step up to the plate." The Cavaliers displayed massive improvement compared to the corps' last performance, according to Harrison, who also said that as World Championships Week approaches, the corps will focus on maintaining a high energy on the field through every performance. Blue Knights (86.00) placed sixth, trailed by Crossmen (7th, 83.25). 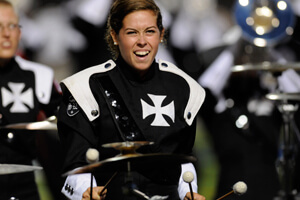 With a strong following on the East Coast, Crossmen Drum Major Caitlin Hall said Saturday night's crowd was cheering so loud that corps members' names rang through the stadium. Pacific Crest (8th, 80.25) and Oregon Crusaders (9th, 77.15) placed ahead of Jersey Surf (10th, 75.15), another corps with a large fan base in Allentown. 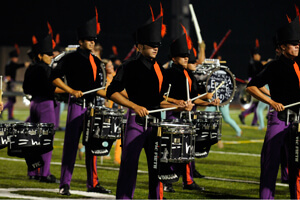 "We really communicate with the audience," Benjamin Godwin, Jersey Surf's drum major said. "Our production is really easy to connect to. We love to bring some light-hearted entertainment." Earlier in the week, Pioneer (11th, 70.75) finished ahead of Cascades (12th, 70.20) for the first time since the Seattle corps began competing in the World Class, and once again came out ahead at the Eastern Classic.